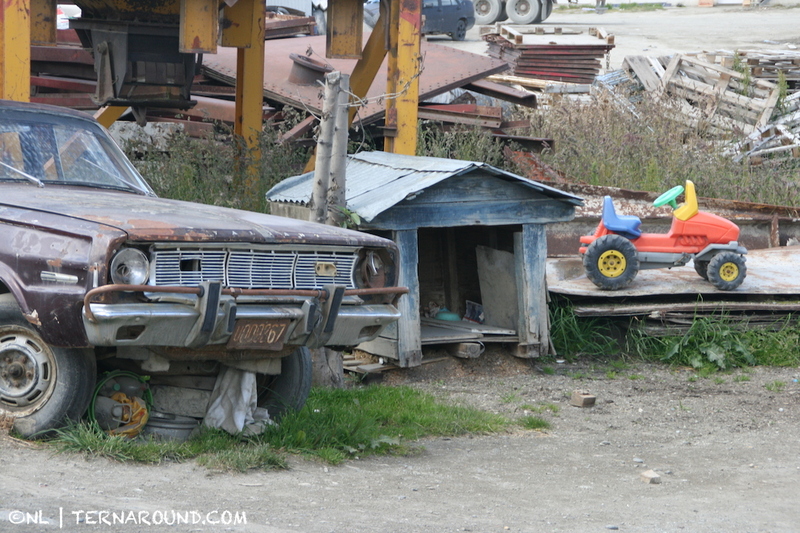 Ushuaia’s inhabitants seem to have a thing for collecting things. Stuff. Pallets. And cars. Now don’t expect a couple of fancy new cars parked in front of their houses. The people here seem to fancy watching old, broken, crashed cars. They leave them resting in the backyard and use them for storage of rubbish of all sorts. It’s hard to belief that these cars remain there because people are attached to them. Strangely no-one really seems to bother the sight of a heavily crashed car. Every other day another car adds to the street collection. There’s buses too. Now gardens are a rare sighting in Ushuaia. Most houses have some terrain, which apparently is not for flowers, but for cars. Then again, most curtains remain closed forever anyway. Still I haven’t figured it out. Is it just the owner’s bare neglect leaving his dirt on the street, or is the local government responsible for taking out the trash? I’ve always been fascinated with this big roofless building, seen from the high road above Ushuaia, where rusty cars are piled up like oranges in the supermarket. Car recycling? I know from experience that drivers here are rather reckless, impatient and fucked up. Which would explain the number of road kill. In Ushuaia, if one loses their life in a traffic accident, they gain a star on the pavement and a road sign bearing their name. I’d think if they leave the car wreck there for a while, it may actually prevent people from driving reckless. Interesting is that – contrary to the rest of Argentina – most people in Ushuaia drive brand new, expensive cars, which roll from Tierra del Fuego’s factories and are sold with a huge tax benefit on the island. I myself would prefer to smack up an old cheap car, but I guess Argentines don’t care much for material things. My neighborhood hosts Ushuaia’s crashed car cemetery. One street, cars mingled with car wrecks, each one with its own unknown, possibly tragic history. Most have been there for a long, long time, ripped from everything that may be of use to someone, growing a wild garden, or just slowly corroding. Some cars come with an excellent Beagle channel view. Others are damaged to the bare structure, which gives me a good idea of car anatomy… may be helpful on one of my next road trips. On a red Lada I spotted a sign saying VENDO, for sale. 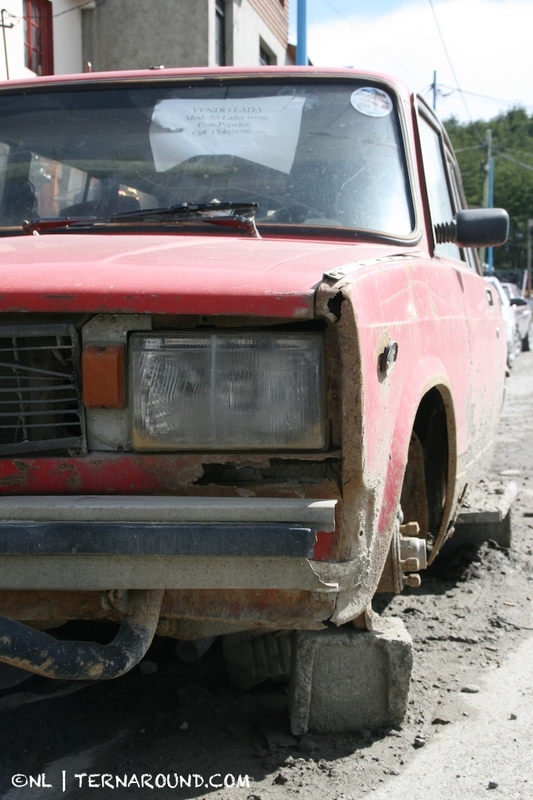 It may be a bargain if you’re willing to put a lot of extra pesos to have it back on the road…. eh… driving. Anyone looking for spare parts? This entry was posted in Ushuaia and tagged Argentina, Patagonia, Tierra del Fuego. Bookmark the permalink.